Ibrahim (Arabic: إِبْـرَاهِـيْـم‎, translit. ʾIbrāhīm, pronounced [ʔɪbraːˈhiːm]), known as Abraham in the Hebrew Bible, is recognized as a prophet and messenger in Islam of God. Abraham plays a prominent role as an example of faith in Judaism, Christianity, and Islam. In Muslim belief, Abraham fulfilled all the commandments and trials wherein God nurtured him throughout his lifetime. As a result of his unwavering faith in God, Ibrahim was promised by God to be a leader to all the nations of the world. The Quran extols Ibrahim as a model, an exemplar, obedient and not an idolater. In this sense, Abraham has been described as representing "primordial man in universal surrender to the Divine Reality before its fragmentation into religions separated from each other by differences in form". The Islamic holy day Eid al-Adha is celebrated in memory of the sacrifice of Abraham, and each able bodied Muslim is supposed to perform the pilgrimage to pay homage at the Ka‘bah (Arabic: كَـعـبَـة‎) in the Hijazi city of Mecca, which was built by Abraham and his son Ishmael as the first house of worship on earth. Muslims believe that the prophet Abraham became the leader of the righteous in his time, and that it was through him that Adnanite-Arabs, Romans and Israelites came. Abraham, in the belief of Islam, was instrumental in cleansing the world of idolatry at the time. Paganism was cleared out by Abraham in both the Arabian peninsula and Canaan. He spiritually purified both places as well as physically sanctifying the houses of worship. Abraham and Ismāʿīl (Ishmael) further established the rites of pilgrimage, or Ḥajj ('Pilgrimmage'), which are still followed by Muslims today. Muslims maintain that Abraham further asked God to bless both the lines of his progeny, of Isma'il and Isḥāq (Isaac), and to keep all of his descendants in the protection of God. Muslims maintain that Abraham's father was Aazar (Arabic: آزَر‎, translit. Āzar), which could be derived from the Syriac Athar, who is known in the Hebrew Bible as Terah. Abraham had two children, Isaac and Ishmael, who both later became prophets. Abraham's two wives are believed to have been Sarah and Hājar, the latter of whom was originally Sarah's handmaiden. Abraham's nephew is said to have been the messenger Lut (Lot), who was one of the other people who migrated with Abraham out of their community. Abraham himself is said to have been a descendant of Nuh through his son Shem. Ibrahim was born in a house of idolaters in the ancient city of Ur of the Chaldees, likely the place called 'Ur' in present-day Iraq, in which case, the idolaters would have been practitioners of the hypothesized Ancient Mesopotamian religion. His father Azar was a well-known idol-sculptor that his people worshiped. As a young child, Ibrahim used to watch his father sculpting these idols from stones or wood. When his father was finished with them, Ibrahim would ask his father why they could not move or respond to any request and then would mock them; therefore, his father would always ground him for not following his ancestors's rituals and mocking their idols. The Quran discusses a certain conversation between an unrighteous ruler and Abraham. Although identification for the unnamed king has been recognized as being least important in the narrative, many historical sources suggest that it was Nimrod, the king who had ordered the building of the Tower of Babel. According to the narrative, Nimrod became extremely arrogant due to his wealth and power, to the point that he made the claim that he possessed the power of creation. Claiming divinity for himself, Nimrod quarreled with Ibrahim, but the Quran describes that he only deepened in confusion. According to Romano-Jewish historian Flavius Josephus, Nimrod was a man who set his will against that of God. Nimrod proclaimed himself as a living god and was worshipped as such by his subjects. Nimrod's consort Semiramis was also worshipped as a goddess at his side. (See also Ninus.) Before Abraham was born, a portent in the stars tells Nimrod and his astrologers of the impending birth of Abraham, who would put an end to idolatry. Nimrod therefore orders the killing of all newborn babies. However, Abraham's mother escapes into the fields and gives birth secretly. According to Muslim commentators, after Ibrahim survived the great fire, notoriety in society grew bigger after this event. Nimrod, who was the King of Babylon felt that his throne was in danger, and that he was losing power because upon witnessing Ibrahim coming out of the fire unharmed, a large part of society started believing in Allah and Ibrahim being a prophet of Allah. Up until this point, Nimrod was pretending that he himself was a god. Nimrod wanted to debate with him and show his people that he, the king is indeed the god and that Ibrahim was a liar. Nimrod asked Ibrahim, "What can your God do that I cannot?" Ibrahim replied, "My Lord is He who gives life and death." Nimrod then shouted, "I give life and death! I can bring a person from the street and have him executed, and I can grant my pardon to a person who was sentenced to death and save his life." Ibrahim replied, "Well, my lord Allah makes the sun rise from the East. Can you make it rise from the West?" Nimrod was confounded. He was beaten at his own game, on his own territory and in front of his own people. Prophet Ibrahim left him there speechless and went back to his mission of calling people to worship Allah. In the mainstream narrative, it is assumed that Abraham's dream of sacrificing his son was a command by God. The verse in reference (i.e. 37:104-105) is in Surah As-Saffat and the quoted ayahs are translated by known Islamic scholar Abul A'la Maududi as "We cried out O' Ibraheem you have indeed fulfilled your dream. Thus do we award the good do-ers." It is assumed that Abraham dreamt that God ordered him to sacrifice his son Ishmael, he agreed to follow God's command and perform the sacrifice, however, God intervened and informed him that his sacrifice had been accepted. Unlike the Bible, there is no mention in the Qur'an of an animal (ram) replacing the boy, rather he is replaced with a 'great sacrifice' (Zibhin azeem). Since the sacrifice of a ram cannot be greater than that of Abraham's son (and a prophet in Islam at that), this replacement seems to point to either the religious institutionalization of sacrifice itself, or to the future self-sacrifices of the Islamic prophet Muhammad and his companions (who were destined to emerge from the progeny of Ishmael) in the cause of their faith. From that day onwards, every Eid al-Adha once a year Muslims around the world slaughter an animal to commemorate Abraham's sacrifice and to remind themselves of self-abnegation in the way of Allah. This is called Qurbani ("sacrifice"). The classical Quranic exegete and historian Tabari offered two versions, whom Abraham was ordered to sacrifice. According to the first strand, Abraham wished for a righteous son, whereupon an angel appeared to him informing him, that he will get a righteous son, but when he was born and reached puberty, he must be sacrificed for God. Later, the angel appeared to Sarah to inform her about the upcoming child. When Isaac was grown, someone appeared to Abraham, invites him to keep his vow. When Isaac was grown, someone appeared to Abraham in a dream and said to him: "Keep your vow which you made! God bestowed upon you a boy by Sarah so that you may sacrifice him" So he said to Isaac: "Let us go offer a sacrifice to God!" So he tool a knife and some rope and went with him until they reached a place in the mountains. The boy said to him: "Oh father! Where is your sacrifice?" He replied: "Oh my son, I saw in a dream, that I will slaughter you. So pay attention to what you see". He said "Oh my father, do what you have been commanded; you will find me, if God wills, one of the patient". Isaac then said to him: "Make tight my bonds, so that I will not struggle to pull back your clothes so that none of my blood will be shed on them for Sarah will see it and be grieved. Hurry! Pass the knife over my throat so that death will be easy for me. When you come to Sarah, greet her'. Abraham began to approach him and, while crying, tied him up. Isaac too was crying such that the tears gathered by cheek of Isaac. He then drew the knife along his throat but the knife did not cut, for God had placed a sheet of copper on the throat of Isaac. When he saw that, he turned him on his forehead and nicked him on the back of the head just as God has said in Quran 37:103: When they had both submitted and he flung on his forehead, that is they had submitted the affair to God. A voice called out: 'Abraham, you have fullfilled the vision!" He turned around and behold, there was a ram. He took it and released his son and he bent over his son saying: "Oh my son, today you have been given to me". That comes in God's saying in Quran 37:107: We ransomed him with a great sacrifice. The second strand, provided by Tabari, states that Abraham was about to sacrifice his son Ishmael and Iblis appeared in form of a man to prevent the sacrifice. Iblis, who had talen on the form of a man, said: "Where are you going, O Shaikh?" He replied: " I am going to these mountains because I must do something there'. Iblis said: "By God, I have seen that Shaytan has come to you in a dream and ordered you to slaughter this little son of yours. And you intend to do that slaugtering!" Thereupon Abraham recognised him and said: "Get away from me, enemy of God! By God, I will most certainly continue to do what my Lord has commanded". Iblis, the enemy of God, gave up on Abraham but then he encountered Ishmael, who was behind Abraham carrying the wood and the large knife. He said to him: "O young man, do you realise where your father is taking you?" He said: "To gather wood for our family from the mountains". He relied: "By God, his actual intention is to sacrifice you!" He said: "Why?!" Iblis replied: "He claims that his Lord has ordered him to do so!" Ishmael replied: "He must do what his Lord commands, absolutely!" When the young man had rebuffed him, Iblis went to Hagar, the mother of Ishmael who was still at home. Iblis said to her: "Oh mother of Ishmael! Do you realise where Abraham is going with Ishmael?" She replied: "They have gone to gather wood for us in the mountains". He said: "He has actually gone in order to sacrifice him!" She replied: "It cannot be! He is too kind and too loving towards him to do that!" Iblis said: "He claims that God has ordered him to do that!" Hagar said: "If his Lord has ordered him to do that then he must submit to the command of God!" So the enemy of God returned exasperated at not being able to incluence the family of Abraham as he wished. However, the words of the Quran never explicitly state that Abraham's dream was a Divine command. The Quran only states that Abraham had a dream, which he interpreted as a command from God, and Abraham was eventually stopped by God Himself from "sacrificing" his son. This is in stark contrast to the Jewish/Christian narratives, and also some non-mainstream Sunni/Shia narratives which assume the biblical narrative is true. According to these views, the problem with this interpretation is that it yields a logical contradiction, as it is clearly stated that no life can be taken without a just cause, and there was no just cause for Abraham to take the life of his son. 'We immediately removed this thought from Abraham’s mind and called out to him, O Abraham. You considered your dream as Allah's command and laid your son for the purpose of slaughtering him! This was not Our command, but merely a dream of yours. Therefore, We have saved you and your son from this. We have done so because We keep those who lead their lives according to Divine guidance safe from such mishaps.' (37: 104-105). As for the term "sacrifice", the meaning of this term as it relates to Ishmael in the following verses is explained as: "As far as the son is concerned, We saved him for a far greater and tremendous sacrifice. (This great sacrifice refers to the fact that instead of keeping his leadership confined to Syria, We wanted him to become the custodian of Our House the Ka'bah, which was located in the far off barren land of Arabia and which had to become the center and gathering place of all those the world over, who believed in the unity of God (internal reference 14:37))." The first passage has been interpreted both literally, allegorically and otherwise. Although some commentators feel that this passage referred to a physical miracle, where Abraham was physically shown the entire kingdom of Heaven (Jannah), others have felt that it refers to the spiritual understanding of Abraham; these latter scholars maintain that the Chaldeans were skilled in the observance of the stars, but Abraham, who lived amongst them, saw beyond the physical world and into a higher spiritual realm. The second passage has one mainstream interpretation amongst the Quranic commentators, that Abraham took four birds and cut them up, placing pieces of each on nearby hills; when he called out to them, each piece joined and four birds flew back to Abraham. This miracle, as told by the Quranic passage, was a demonstration by God to show Abraham how God gave life to the dead. As the physical cutting of the birds is not implied in the passage, some commentators have offered alternative interpretations, but all maintain that the miracle was for the same demonstrative purpose to show Abraham the power God has to raise the dead to life. The third passage has also been interpreted both literally and metaphorically, or in some cases both. Commentators state that the 'fire' refers to main aspects. They maintained that, firstly, the fire referred to the physical flame, from which Abraham was saved unharmed. The commentators further stated that, secondly, the fire referred to the 'fire of persecution', from which Abraham was saved, as he left his people after this with his wife Sarah and his nephew Lot. One of Abraham's most important features in Islamic theology is his role as the constructor of the Kaaba. Although tradition recounts that Adam constructed the original Kaaba, which was demolished by the Great Flood at the time of Noah, Abraham is believed to have rebuilt it in its original form. The Quran, in the Muslim perspective, merely confirms or reinforces the laws of pilgrimage. The rites were instituted by Abraham and for all Muslims, as they perform the pilgrimage, the event is a way to return to the perfection of Abraham's faith. Just as Medina is referred to as the "City of the Prophet [Muhammad]" or simply the "City of Muhammad", Mecca is frequently cited as the "City of Abraham", because Abraham's reformation of the monotheistic faith is believed to have taken place in Mecca. The Quran refers to certain Scrolls of Abraham, which have alternatively been translated as the Books of Abraham. All Muslim scholars have generally agreed that no scrolls of Abraham survive, and therefore this is a reference to a lost body of scripture. The Scrolls of Abraham are understood by Muslims to refer to certain revelations Abraham received, which he would have then transmitted to writing. The exact contents of the revelation are not described in the Qur'an. Chapter 53 of the Quran, sura An-Najm, mentions some more subject matters of the earlier scriptures of Abraham and Moses. Yet some scholars[by whom?] suggested it to be a reference to Sefer Yetzirah, as Jewish tradition generally ascribed its authorship to Abraham. Other scholars, however, wrote of a certain Testament of Abraham, which they explained was available at the time of Muhammad. Both of these views are disputed. And if those would have existed, according to clear instructions in the Quran and hadith, no verification should take place. Abraham's narrative in the Quran indirectly refers to his role as one of the great patriarchs. The Quran says that God made Abraham "an Imam to the Nations. ", Father of Muslims, and his narrative records him praying for his offspring. The Quran further states that Abraham's descendants were given "the Book and Wisdom", and this fact is reinforced in a verse which states that Abraham's family was one of those in which the gift of prophecy was established as a generic trait. The Quran emphasizes upon Abraham's significance as it states that Abraham's family, Noah, Adam and the family of Amram were the four selected by God above all the worlds. As a result of his significance as a patriarch, Abraham is sometimes given the misleading title Father of the Prophets, which contradicts the teachings of the Quran, which establishes that many prophets, such as Noah, lived before Abraham. Of Abraham's immediate sons, the Quran repeatedly establishes the gifts God bestowed upon them. Ishmael, along with Elisha and Dhul-Kifl (possibly Ezekiel), is regarded as being "of the Company of the Good." and one of the men who was given "favour above the nations." In addition, Ishmael is described as being "true to what he promised, and he was a messenger (and) a prophet." Likewise, the Quran says of Isaac that he was "of the company of the Elect and the Good." and was "a prophet,- one of the Righteous." and further describes him as "of Power and Vision." Muslims believe that Ibrahim was buried, along with his wife Sarah, at the Cave of the Patriarchs in Hebron. Known to Muslims as the Sanctuary of Abraham it is also thought to be the burial site of Isaac, his wife Rebecca and Jacob and his wife Leah. ^ a b Siddiqui, Mona. "Ibrahim – the Muslim view of Abraham". Religions. BBC. Retrieved 3 February 2013. ^ Prophet, Ibrahim. "Father". Islamicity. Retrieved 31 January 2013. ^ Ibrahim, Prophet. "Father". Haq Islam. Retrieved 31 January 2013. ^ Lings, Martin. "Muhammad". House of God Chap. I (cf. Index: "Abraham"), Suhail Academy Co.
^ "Ibrahim". Encyclopedia of Islam, Online version. ^ Lives of the Prophets, L. Azzam, Suhail Academy Co.
^ Jacobsen, Thorkild. "Mesopotamian religion". Encyclopædia Britannica. ^ "Abraham and the Idols (Middle Eastern, Islamic, Muslim Legends, Stories)". aaronshep.com. ^ Pan India Internet Pvt Ltd. "Ibrahim - Father of Prophets - Prophets of Muslim community - Prophet Ibrahim". festivalsofindia.in. ^ "Prophet Ibrahim The Father of all the Prophets". missionislam.com. ^ "The Father of the Prophets". islamicity.com. ^ "Ibn Kathir: Story of Prophet Ibrahim/Abraham (pbuh)". islamawareness.net. ^ Book 1: The Prophet Abraham, Harun Yahya, The Unbeliever Advised By Abraham, Online. web. 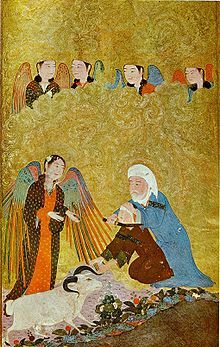 ^ Book 1: The Prophet Abraham, Harun Yahya, Angels Who Visited Abraham, Online. web. ^ "Title". Answering Islam. Retrieved 1 February 2013. ^ a b c Michigan Consortium for Medieval and Early Modern Studies (1986). Goss, V. P.; Bornstein, C. V., eds. The Meeting of Two Worlds: Cultural Exchange Between East and West During the Period of the Crusades. 21. Medieval Institute Publications, Western Michigan University. p. 208. ISBN 0918720583. ^ Glassé, Cyril (1991). 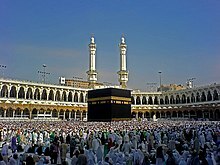 "Kaaba". The Concise Encyclopedia of Islam. HarperSanFrancisco. ISBN 0060631260.